Ten years ago M read a book by Jan Morris – Venice – a love letter to one of Europe’s most beautiful cities. It’s all you need to know about the place. At the time of reading it seemed to be a contemporary book but was, in fact, written in 1960 – which shows how little Venice had changed over the decades. 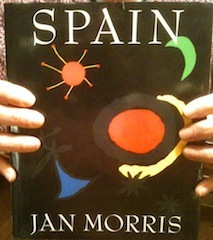 Morris is an evocative writer and this book is a rich, poetic travelogue mixing history, personal observations, art and culture. Its chapters are themes rather than a chronological account: Wild Spain, Sol y Sombra (about Andalucia), The Soldiers – and Aliens. Cecilia Eales’s beautiful watercolours bring the book further to life. ‘You are seldom halfway in Spain. It is either fearfully hot or frightfully cold. You are either a good man or a bad one, either very rich or very poor, either a fanciful church-goer or an out-and-out disbeliever. If any book about a country makes you want to leave for it the next day, this is it.